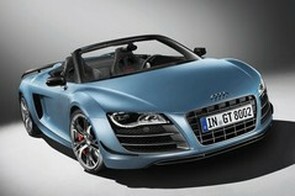 Audi has revealed a soft-top version of its R8 GT special edition called - imaginatively - the R8 GT Spyder. Like the coupe, power comes from a 552bhp, 398lb ft version of the R8's 5.2-litre V10, making the R8 GT Spyder good for a top speed of 197mph and a 0-62mph run in 3.8 secs. Audi has also chopped 85kg from the regular Spyder's kerb weight, largely down to extensive use of carbon fibre, including the soft-top's cover, the rear spoiler and the rear bumper. Oh, and the seats - which save a total of 32kg over the regular car's chairs. Visual clues to the R8 GT Spyder include a twin-lipped front spoiler, carbon fibre winglets on the front bumper, dark LED taillights, a larger rear diffuser and distinctive round tailpipes. Production will be limited to just 333 units (as with the coupe version) Irish prices haven't been announced, but in Euro-land the R8 GT Spyder is set to cost 207,800 euros.